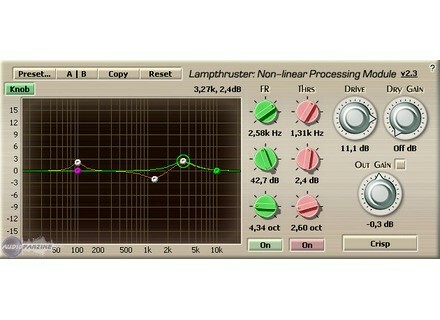 Lampthruster 2.x, Software Amp Simulator from Voxengo. Voxengo is offering discounts on several of its pro audio software plug-ins until January, 1 2009. Ordering two or more products will get you an additional 12% discount on the total order sum. For more detail, check out Voxengo's website. Updated SPL Transient Designer software Sound Performance Lab (SPL) has released a new version (1.0.2) of its Transient Designer software for Mac and PC. Bugfixes include DP6 support, enhanced audio-algorithm and improved mouse-wheel control on PC. G-sonique Pultronic EQ-110P G-Sonique Digital Instruments has announced the release of Pultronic EQ-110P, an emulation of the classic professional parametric vacuum tube equalizer from 50s and 60s. ApulSoft apEQ v1.3.2. ApulSoft has updated apEQ to v1.3.2.